I am an English teacher teaching foreign language students (young adults) at The Language Lab which is part of the IH World Organisation. I live and work in Johannesburg, South Africa. Fully editable. Elementary and higher. 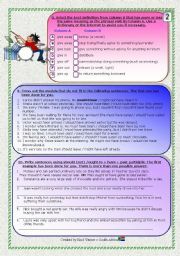 A song to teach Phrasal verbs with �GIVE�. 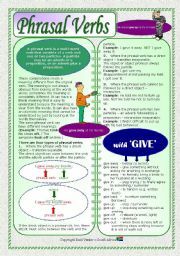 Grammar guide (Part 1) can be found at http://www.eslprintables.com/printable.asp?id=420247#thetop. 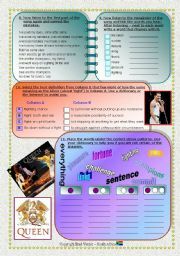 The first part of the song worksheet is at http://www.eslprintables.com/printable.asp?id=420249#thetop. 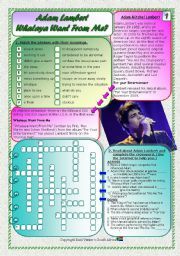 Tasks and answer key. Lyrics and video link. IELTS - tips to assist (hopefully) candidates to attain higher band scores in the IELTS listening and reading tests. Prepositions revision - Who Wants To Be A Millionaire? 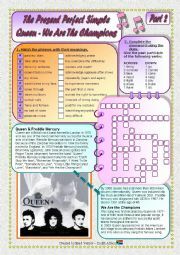 A game to help with the learning and revision of prepositions that some students find difficult to remember. Students need to select the correct adjective depending on the context. The vocabulary has been taken from various course books. I have not included any money to be allocated during the game as I divide the students into groups, which then compete against each othert. Intermediate and higher levels. Students select the correct quantifier - much, many, a lot, a bit, a great deal of, a few, a little, a piece. A gap-fill task to teach/revise WH-question words and HOW question words (eg who, where, how many, how often). 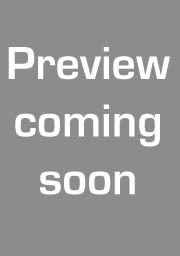 Students must enter the answer on the Smartboard by tapping on the on screen �keyboard�. There is a timer attached so they must complete the word/s within the given time. For intermediate and higher levels. Collocations contained in the lyrics are concentrated on. 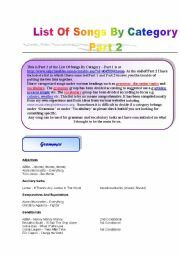 You can also use this lesson as a listening task - the mp3 file is embedded. Select the odd one out. The vocabulary is related to �possibility� and uses terms like �possibility�, �chance�, �likelihood�, �option�, �no doubt�. 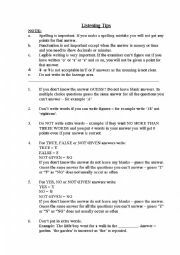 �hope�, �hopeless� and so on ... Should you want to edit the file - the password is �enid�. A gap-fill to revise/teach crime vocabulary.